Over the past few months, concern and awareness about water resources have reached an unprecedented high. The conversations about water resources now are not confined to the privileged discussions in air-conditioned rooms of New Delhi’s policy circles. It has now become part of everyday discussions in offices, households and markets. Two successive events have led to such a watershed change in discussion on water resources. First, the news came in that Shimla is running out of water and was forced to turn away tourists that drive the city’s economy during summer. The development bore an unfortunate resemblance to Rango—an animation movie showing desperation of villagers on the brink of depleted water resources. The unfortunate event gave the country an early glimpse of what may happen if we continue to recklessly waste water. Second, NITI Aayog released the Composite Water Management Index (CWMI) in June. The CWMI is a pioneering exercise that seeks to identify, target and improve key water resources-related indicators. This index highlighted the current plight, showing how low-performing states house approximately 50% of India’s population, and how 21 major cities may run out of ground water by 2021. The index has a set of 28 key performance indicators (KPIs) covering irrigation status, drinking water and other water-related sectors. Critical areas such as source augmentation, major and medium irrigation, watershed development, participatory irrigation practices, sustainable on-farm water use practices, rural drinking water, urban water supply and sanitation, and policy and governance have been accorded high priority. By changing the public discourse, the index has begun to achieve its purpose. The next goal, however, is to identify a set of realistic, actionable and specific policies which states can adopt to move ahead on water conservation, which will also be indicated in their ranking on the CWMI. According to the report of the National Commission on Integrated Water Resources Development, the projected demand for water by 2050 is likely to reach 1,180 billion cubic metres (BCM), which will outstrip the availability of 1,137 BCM. Presently, irrigation water use accounts for 80% of the available water, i.e. 700 BCM. However, within the limited availability of 1,137 BCM we need to cater to the growing demand of the population, including domestic water requirement, industrial requirement, ecology sustenance, and power generation requirement, among others. It is estimated that irrigation requirement has to be lowered to the level of 68% of the total demand by 2050. The domestic and industry sectors are likely to take up, respectively, 9% and 7% of the demand. Moreover, the present level of irrigation efficiency for surface and ground water is 30% and 55%, respectively. It is desired that the efficiency level of surface and ground water irrigation by 2025 should reach 60% and 75%, respectively. The following measures are some of the key policies which will help states achieve quick and significant gains on water use efficiency, which will help in better resource management. First, Punjab, Haryana, Uttar Pradesh, Bihar, Maharashtra, Telangana and other water-deficient states should promptly move towards micro-irrigation systems. These techniques have significantly higher efficiency vis-à-vis flood irrigation techniques. The states have started taking cognizance; but we need to accelerate the transition to micro-irrigation. The total potential for micro-irrigation in the country is around 69 million hectares. Conventional surface irrigation provides 60-70% efficiency, whereas, higher efficiency of up to 70-80% with sprinkler and 90% with drip irrigation systems can be achieved. Second, the states should continue to focus on command area development (CAD). This is now part of Pradhan Mantri Krishi Sinchayee Yojana (PMKSY) which focuses on “more crop per drop”. CAD, launched in 1974, has now become a widely accepted model for increasing water-use efficiency in irrigation. In addition, CAD will play a critical role in bridging the gap between irrigation potential created (IPC) and irrigation potential utilized (IPU). Third, the cropping patterns in the states should be changed as per the agro-climatic zones. Improper cropping patterns affect both crop productivity and irrigation efficiency. India has come a long way from the days of the Green Revolution and now it is time to focus on more nuanced aspects of water-use efficiency and agriculture productivity. One such example of improper cropping pattern is the sugarcane production in western Uttar Pradesh and parts of Maharashtra—regions suffering from severe water crisis. Similarly, paddy cultivation in Punjab, where the stage of ground water development is 149%, indicates inefficient use of water. Fourth, we need to address the issue of fragmentation in farming. This matter has been studied from various aspects of income and productivity, but it holds immense value for increasing water-use efficiency. There are two measures to tackle this issue. First, states can expedite the adoption of the Model Agricultural Land Leasing Act, 2016—which can lead to consolidation of small farms. However, given the informality of agriculture in India, the second option may provide early gains—creating and ramping up farmer producer organizations (FPO). FPOs provide a sense of ownership to farmers and encourage community-level involvement with lower transaction costs. Almost 70% farmers in India are marginal farmers and the average farm size is 1.15 hectares. Therefore, there is a huge opportunity in forming the FPOs. This will lead to economies of scale on farm produce, water-usage and cost of production. 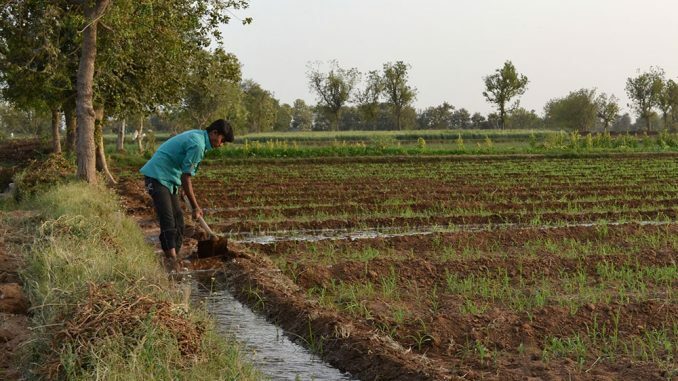 The above measures have huge scope for changing the landscape of water efficiency in the irrigation sector, which accounts for the majority of water resource consumption in India. Doubling farmers income by 2022 is a noble vision, but preserving water resources for the sustainable growth of India is as critical. Both goals are not divergent. On the contrary, they perfectly complement each other. Avinash Mishra and Devashish Dhar are, respectively, joint adviser and public policy specialist at NITI Aayog.